Proud supporters of the Olympic and Paralympic Games! To provide excellent chiropractic care, patient education and holistic support with the intent to stimulate, nurture and facilitate growth and well being for our community. Thus empowering and inspiring a new paradigm of health based on the philosophy and principles of wellness. Let our health team handle your rehabilitation and manage your pain using the latest approved techniques and methods. We’ll look at your overall well-being to create a plan that will leave you feeling fantastic. Restore your mobility by letting our physical therapists handle your rehabilitation. Ensuring you get the physical rehabilitation you need is our first priority. 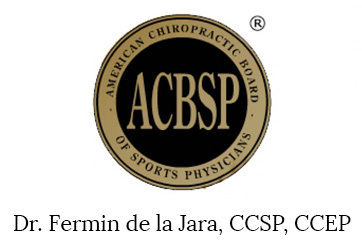 Dr. de la Jara is a Board Certified Sports Chiropractor in Lake Ridge, Occoquan, Manassas and Woodbridge VA. Along with a background and years of experience with sports conditions, Dr.de la Jara also specializes in family care. I would recommend Dr. D to just about anyone who is looking for a #1 Chiropractor. He’s got a great ‘bedside’ and is very personable. He’ll cater to the individual’s needs based on their medical history. He is very caring and conscious about giving you the very best chiropractic treatment. He is well educated and experienced and makes you truly believe in chiropractors. As a dental hygienist, I benefit greatly from his adjustments and stim treatments since my upper shoulder gets a lot of repetitive stress from leaning over patients. My follow up appointments allow me to maintain my shoulder and will extend my time in my profession. Dr. de la Jara and the team at his office are great. He is a competent and professional chiropractor who is gentle and knowledgeable and spends as much time as necessary with each of his patients. He very clearly explained the problem I was having and with his recommended exercises and treatments my back is feeling great. He truly wants to help his patients and does his best to make you feel better. I highly recommend Dr. de la Jara. I began visiting Dr. de la Jara following years of playing sports. I was overweight and uneducated about the benefits of chiropractic care. Dr. D spends as much time growing his relationships with his clients as he does educating them, and providing not only adjustments, but additional, complementary forms of treatment to relieve pain and restore structural integrity. He is kind, very knowledgeable about his work, and always willing to take time to listen to his clients. I would recommend him to anyone.